Find Rosehip Hats in the Public Market on Granville Island March 23 - April 2, 2018 Open daily 9am to 7pm **Please check back for updates to my booked schedule at the Market. Find Rosehip Hats in the Public Market on Granville Island April 9 - April 15, 2018 Open daily 9am to 7pm **Please check back for updates to my booked schedule at the Market. 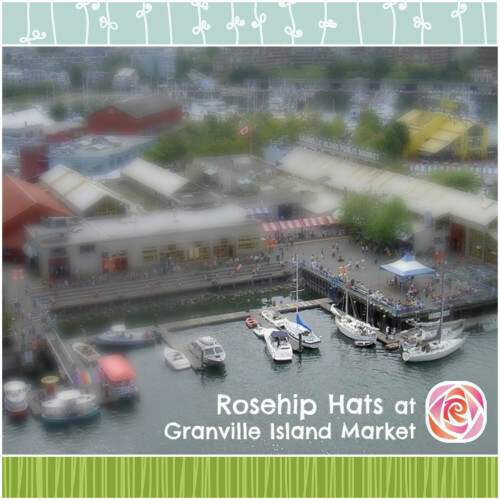 Find Rosehip Hats in the Public Market on Granville Island June 9 - 24, 2018 Open daily 9am to 7pm **Please check back for updates to my booked schedule at the Market. Find Rosehip Hats in the Public Market on Granville Island 9am-7pm December 20 - 31 - market closed 25th & 26th (note: waitlist dates Dec 17 to 23 - please check back here for confirmation) **Please check back for updates to my booked schedule at the Market.